Renko charts are a way to view price movements of an asset. Renko charts filter out minor price movements, making them a preferred choice by some traders. Because some minor price fluctuations are filtered out, trends in price may be easier to spot, and the chart appearance is more uniform compared to candlestick charts (another popular chart type). This comes at a cost though, as some price information is lost. 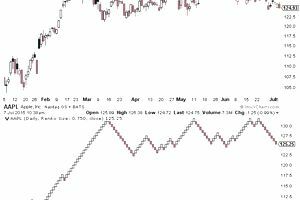 Renko charts are created by setting a "box size." In the stock market, it may be $0.10 or 10 pips in the Forex market. A box on the Renko chart forms once the price has moved that amount, but not before. A candlestick chart, on the other hand, shows the price movement over a period of time, such as one minute or one day. While there is a time axis along the bottom of the chart, there is no set time limit for how long a Renko box takes to form. It could take 2.5 minutes, 8 minutes or 8 days. It all depends on how volatile the asset is, and what box size you set. Figure 1 (click to enlarge) shows both a daily candlestick chart and a $0.75 box size Renko chart of Apple (AAPL) stock. Looking at the time axis, with this box size, the two charts show the price action over approximately the same amount of time (early January to early July 2015). The comparison reveals differences in how the price action is portrayed. The most striking difference is how smooth the Renko chart looks compared to the candlestick chart (the same would be true of a High, Low, Close or Open, High, Low, Close bar chart). Each Renko box is exactly $0.75 (box size chosen), giving the chart a uniform appearance. On a candlestick chart, each candle could be any value. A new Renko box always forms at the top or bottom right corner of the last Renko box, meaning the price action is always portrayed at 45-degree angles. Since the box size is $0.75 if the price advances $0.75 then a new Renko chart box forms. "Up" boxes are typically colored white or green. A "down" box is typically colored red or black. Notice that boxes are never beside each other, always at 45-degrees. Therefore, if the price advances $0.75 and an up box is drawn, the price must decline $1.50 (two box lengths) to form a down box. For example, if a move from 115.75 forms an up box. if the price drops back to 115 that would put a box right beside the last up box. But Renko charts only move at 45-degree angles, which means the price must drop to 114.25 before a red box forms. This is why Figure 1 shows long periods of white and red boxes moving in one direction, while the candlestick chart appears to change direction (in minor ways) more often. One major difference with Renko charts is that they don't give you the most current information. The chart only updates when a new box is created. The candlestick and Renko chart snapshots were taken at almost the exact same time, yet the candlestick shows a price of 124.93 while the Renko chart shows a price of 125.25. Candlestick charts always show the last price or transaction (assuming you have real-time quotes), while Renko charts show the price that created the last box. Also, because Renko charts are based on box size they also won't reflect the exact high or low the price of an asset reached. If a new box forms at 134.25, and the price reaches 134.54 and then reverses, the candlestick chart will show the price reaching 134.54, while the Renko chart will only show the price reaching 134.25 (because the price didn't move high enough, another 0.75, to create another box). The smaller the box size the quicker the price information will update on Renko charts, but this will also cause the chart to look more choppy. Selecting "Pts" (points) means you want each box to represent a certain price movement. The 0.75 box shown in the chart example is an example of this. Selecting "ATR" (Average True Range) means you want the box size to adjust to the typical price movement an asset sees over a specific period of time. For example, if the price has an ATR (5 periods) of $1.20 currently (this will fluctuate), then the box size is set to $1.20. The box size will change as ATR changes. With this option, you also select how many time periods you want calculated in ATR. If you select "Close" it means the Renko chart will only update if the price of an asset closes at a price which creates a new box. For example, if using a 0.75 box and then the price needs to reach 115 in order for a new box to form (last box at 114.25) a new box will only be drawn if the price closes above 115. If the price reaches 115.25 during the day but closes at 114.95 a new box will not be drawn. High/Low draws new boxes as relevant prices are reached. This creates more boxes; in the example above the 115 box would be drawn. Each trader must choose the chart style that is best for them. One style isn't necessarily better than another, they just show price information in different ways. Renko charts filter out some of the minor price fluctuations, making trends a bit easier to spot. This means some information is lost though, including some forms of analysis such as candlestick patterns. For eye-opening day trading tips and resources, sign up for the Renko charts sent out once a week.